Just one of the many ways Geotech adds value. Geotech Environmental Equipment, Inc. serves a variety of clients through in-house training at our Denver, Colorado headquarters and local offices around the country. 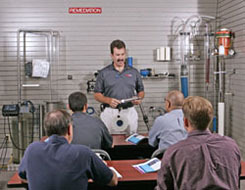 You may arrange for one-on-one tutoring, or bring all your technicians for a comprehensive seminar. Let’s face it, the technology in our industry is changing, so whether you’re a seasoned professional or new technician, Geotech can tailor a presentation to meet your specific training needs. Topics include operation and maintenance of handheld water quality instrumentation, air-monitoring devices, pumping equipment, and remediation equipment operation and troubleshooting. Our training classes are largely hands on so you get the maximum benefit for your time while visiting with us, and best of all, the training won't cost you anything! Our facility can handle classes of 1 to 50 and lodging can be arranged close to our facility. All you need to do is cover your own transportation, meals and lodging expenses. We’ve had the privilege of helping clients with training both nationally and internationally and look forward to serving you. PS. Don't forget to bring your equipment with you for free cleaning and calibration. Call 1-800-833-7958 for more information.